Well, it’s that time again—spring, and that means spring dresses! Specifically, an Easter dress for my granddaughter. It always takes me a long time to make my decision before I begin sewing. I remember Easter dresses that Mom made for my sister and me. One year that particularly sticks out in my mind is the one we had dresses with matching coats. (I am sure it was during the Jackie Kennedy reign that the coat and dress ensemble became so wildly popular.) Mine was a yellow coat with a patterned dress underneath, probably linen. Mom worked for days on our Easter outfits—each stitch was a labor of love. My first project was a hot-pink apron complete with antique lace medallions—an odd combination, but I just loved it. When I finished that project, I was hooked. Mom had taught me the basics and instilled in me a love of sewing. My sister and I are so thankful she sewed. We had handmade clothes our entire lives, and I am sure that old black Singer will still sew a fine seam. Now, sewing for Amelia has become my passion. I love seeing her try on a new dress and then spinning around to make sure it is full enough and stands out the appropriate amount. I think girls have been doing that for decades. There is something special about a “spin-around” dress! She has a new sewing machine of her own in my sewing room, and I can hardly wait to start teaching her. I selected a Baby Lock Sophia 2 for her, a small machine but one she will use for years. She loves bright fabrics, and I want her to be excited about her first project. 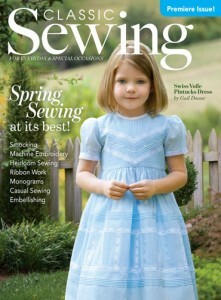 Since we launched Classic Sewing magazine in November, we have heard countless stories of women teaching others to sew. We are seeing a resurgence of young people sewing and children taking classes to learn to sew. It’s not the money-saving mission it used to be but the enjoyment of making something. In this fast-paced world, teach a young person to do something with their hands. Whether it is baking, sewing, painting, or gardening, choose something that is creative. which creative arts feed one’s spirit is the joy. Thank you for feeding our souls! My first impression of learning to sew came from both my mother and grandmother. My grandmother visited us one summer and she gave me some basics which was making doll clothes to start. I guess she figured if I could make those, then I would have the knowledge to try making regular clothes. My mom, on the other hand, gave me the ‘how to’ to use the machine. When I was in high school my best friend inspired me to sew more as she would look at an outfit then promptly would take newspaper or some other paper and make the pattern for it. I never became that handy, but could take a ready made pattern and rework it to create the outfit. We made a couple of matching outfits to wear to school, albeit different colors. As my daughter came along I made a lot of her school clothes plus outfits for Easter and other special occasions, incorporating my own needlework touches. For my son I made some of his clothing, but one shirt I made he passed down to his own son! For the most part I really read a lot and taught myself to master techniques in sewing and have made projects for the home, some quilting as well as designing clothing! My daughter learned from watching me and she often made her own school clothes in high school and how to alter ‘ready-made’ outfits giving them her own special touch to them. I love the dress you made for Amelia! What a cute young lady you have there! My mother taught me to sew when I was 8 years old. She always says I taught myself but if she had not taught me the basics, I wouldn’t be the seamstress I am today. I made all of my clothes through high school. While my family would be reading books and playings cards, I would be sitting at my sewing machine making myself something new to wear to school the next day. I made numerous Raggedy Ann dolls to sell and make a little money as a teenager. While I was expecting my child, I took several classes in French machine sewing but ended up having a wonderful son. So much for the classes. Even though my projects have gone from clothing to draperies for the home I continue to make Raagedy Ann dolls as baby gifts. I love being creative by making their hair color pink or Aqua in place of the standard red. I just retired from working after 40 years and can’t wait to Make my sewing room my new office. I stayed with my grandmother the summer I turned 12 to keep her company after my grandfather had just passed away. She taught me to sew that summer – what a wonderful memory. I had 3 sisters and my mother sewed all of our dresses – often 4 matching ones that were handed down. My youngest sister got to wear the same dress 4 times! 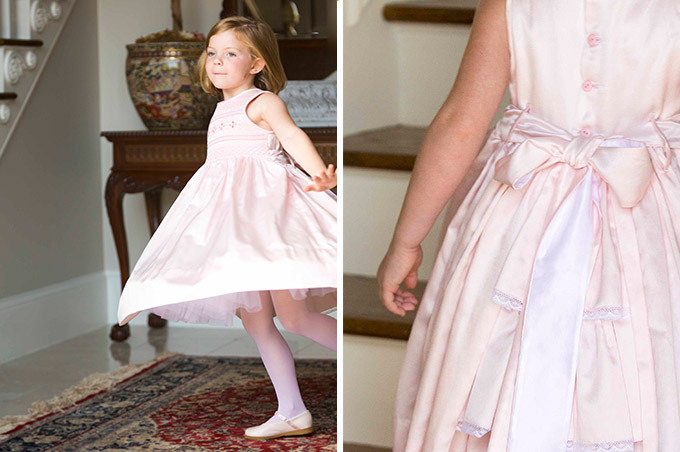 I have 4 daughters I sewed dresses for – but not matching ones! I enjoy your lovely posts so much Phyllis and I am so impressed that you take the time to sew with all of your responsibilities! Amelia is so pretty and her dress is beautiful! I was one of 9 children–7 girls and 2 boys–and my mother made most all the girls’ clothes until we graduated high school and then most of our wedding dresses and trousseaus. ( I might add her sewing machine was a Singer Slant-O-Matic 500 just like the one you featured in Southern Lady several years ago, and I inherited it and still sew with it some 60 years later.) She was so talented, not only sewing clothes, but making professional drapes and doing alterations. When the leisure suits were popular, she made my daddy several, as well as dress suits that looked like he bought them at a fine men’s store. I also love to sew, but a career and having only boys caused me to drift away, and most of the time I just do alterations or small projects. Still grateful for the heritage my mother passed down to me. I have been looking at patterns for dresses for my granddaughter. I have been teaching my oldest granddaughter to sew. A couple years ago I bought her Hllo Kitty machine. It is a real machine just smaller. Loved this post. I haven’t bought an Eastwr dress in years but it used to be a highlight for me. Maybe I will have to look for one this year. I have taught sewing to girls 10 and older for the last five years and what a joy to pass it on. I have five basic sewing machines and teach the first basics…they amaze me with their color sense and creativity. I only have one problem…they don’t want to go home….”please can we stay longer”! It’s not fancy but it gets them started! I agree with all the above comments…you are so talented Phyllis, and you have the sweetest granddaughter! I grew up in the sixties and my mom made so many of my outfits…also knitted my sweaters too. My Easter dresses were spectacular. She had a seamstress that made special occasion clothes for her…later that seamstress made my wedding dress…just by looking at one in a magazine! Unfortunately, as hard as I tried I could not sew…even in home economics class, all I came up with was a lion pillow. And then all the missed loops in knitting frustrated me to no end. Sewing ones own clothes opens up so many possibilities in design, colour, fabric etc. Alas, I can only admire the works of others. Happy sewing everyone. You must share your granddaughter’s first sewing project to spur us on! She is beautiful! Your granddaughter is beautiful. I am sure she will treasure these sewing memories. Please bring back the School of Art Fashion. It was so wonderful to see different generations all sharing a passion for sewing. I miss those days. I love spring dresses… It reminds me that Easter is around the corner… I just love the colors that are associated with Easter… The soft hues of pink, green yellow and blue… My mom did not make my dresses but she did make a big deal when Easter came around… New shoes, bag hat gloves and a duster coat which it was called in the 1950’s! Of course all my dresses were worn with a crinoline! That made the dress look even more beautiful! Your granddaughter is so very lucky that she has you to teach her all the fundamentals of sewing and most of all sharing quality time with you. Enjoy! I love the pictures of Amelia! What a beautiful dress. You are so talented Phyllis! Thank you for sharing! Have a happy time teaching her to sew. I sew, but unfortunately I did not so dresses for my daughters. A regret. What a beautiful dress you made for Amelia, Phyllis. My mom taught me to sew too, and my very first project was also an apron. Yours, in pink with the doilies, is quite inspired! I am constantly in awe at the amazing workmanship in the antique clothing, tablecloths and lace I sell in my antique shop, your dresses will surely evoke the same wonderment for your family’s future generations. 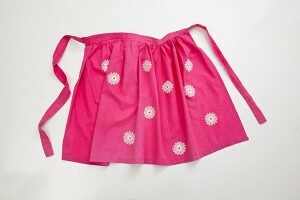 Anna, I would love to hear advice on sewing for my 7 year old daughter who is adamant that she wants to learn. The sewing studio nearby said we needed a $200 singer machine with the latest digital gadgets for her to enjoy and I was hesitant as I don’t know if she will like it once we start. I had bought a $60 lil sew machine that they said was a toy and truly even my mom cold not get it easily started right. My mom and grandmother had machines but I do not so I can’t easily teach. Would love to hear any advice for that age group on best way to start for great positive experience. Jennifer, I love that you want to inspire your 7 year old daughter. I was so fascinated by my Mother’s Singer treadle machine in my younger days, then when my sister reached junior high school and took a sewing class, Mother had the machine electrified. I must have really pleaded that I wanted to learn how to sew also, so my sister took it upon herself to teach me. I was sure she did “magic” the day she showed me how to get the bobbin thread up from the bobbin case! Then she drew lines on paper and without thread I was told to sew on the lines. Sometimes my “homework” included curved lines. My sewing lessons included a lot of punched paper. I still love to sew. My days of school clothes, prom dresses, flower girl, and bridesmaid dresses are in the past, but now I sew Christmas presents, drapes and do a lot of family clothes repair and alterations. It has been a fun way to express my creativity for many years. Bless you for wanting to give that gift also to your daughter. Thank you so much for sharing Amelia’s new Easter dress. Both she… And the dress…. Are simply DARLING. What a special bond you will always have with her, love AND love of sewing. I’ve said before I envy your ability to sew, taught by your mother. My mother was such a dear! But, could not sew a stitch and neither can I! I wish I had asked my grandmother to teach me. She made such wonderful things (such as canopy and dust ruffle to match for my sweet little daughter’s bed when she was small). Now, I have a portable machine and as I’ve said before it sits unused. I’ve pulled the instructions and will try something simple. I do love needlework…knitting, crewel etc. Maybe I will give my young granddaughters needles, yarn and a cute bag and at least use that as a fun project since I can’t sew. Anyway, Phyllis, as usual you inspire us with your blog and darling pictures and story of fun with your Amelia. Thanks so much! Beautiful! We gave our granddaughters, ages 7 and 6, sewing machines for Christmas with a promise to teach them to sew. The week after Christmas, here in North Texas, we had unseasonable storms with high winds, hail, and tornado warnings. When it was time go to their “safe room,” our 7 year old took her new sewing machine with her. She just couldn’t imagine letting it get blown away. 🙂 Made my heart do a happy dance! My Mom also used to make matching Easter dresses for me and my sisters. I still remember my favorite was dotted swiss with matching bonnet and gloves…loved it! THe dress is just beautiful and she is adorable.